Mr. Munk embodied the Canadian dream. His family came to Canada via Switzerland after fleeing Nazi persecution. Like so many immigrants who have contributed to Canada’s national fabric, Peter Munk never took our geography, values and rule of law for granted. He believed Canada provided him the opportunity to not only dream, but more importantly, to pursue his aspirations. In turn, he became an inspiration to young entrepreneurs and new Canadian citizens nationwide. Mr. Munk continuously gave back to Canada through the opportunities and wealth he created for hundreds of thousands of Canadians through the founding and building of Barrick Gold Corporation, which he grew into one of Canada’s most respected companies. He shared his success with Canada through generous philanthropic activities, including significant contributions to support world-class education, improve health care facilities and advance public policy. Among his many awards and titles, including the Companion of the Order of Canada, we were honoured to award Mr. Munk with The Fraser Institute’s Founders’ Award in 2010, which is presented annually to individuals for their outstanding entrepreneurship, dedication to free-enterprise and generous philanthropy. 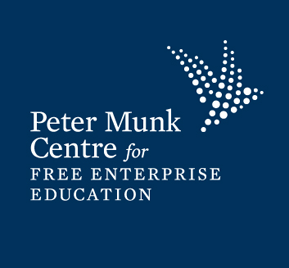 In 2016, Mr. Munk donated $5 million to launch The Peter Munk Centre for Free Enterprise Education at the Fraser Institute, which allowed us to greatly expand our education programs in Central Canada, impacting thousands of future opinion leaders who will go on to occupy key roles in business, law, journalism, politics and academia. In the first year and a half of its operations, The Peter Munk Centre held 20 education programs and influenced over 26,000 high school and university students, teachers, and journalists. Mr. Munk once said, “As a Canadian for whom citizenship was not a birthright but a gift of happenstance, I am grateful for the opportunities that have been given me by this great country”. We here at the Fraser Institute will forever be grateful to Mr. Munk for his support and gift to the Fraser Institute, which will have a lasting, profound impact on Canada, and which will help to protect and ensure it remains a country of opportunity for all. We will continue to hold Peter Munk in the highest esteem and we are honoured to preserve his legacy in educating Canadians about the power and benefits of free-enterprise.